Cosmic Fortune is an alien invasion-themed 15-payline progressive slot running on the NetEnt software platform. The scatter symbol is denoted by an S written on it and the wild symbol features the letter W. Players are welcome to try this futuristic slot on this page for free or visit any of the listed NetEnt casinos to play the game for real money. Cosmic Fortune is a five reels slot with three rows and fifteen fixed paylines; the murky backdrop to those reels suggests a cloudy night sky or perhaps a view of outer space. The symbols are all beautifully designed and metallic in nature; each metal sphere represents some sort of space-themed item and so we have an asteroid, the moon, a spaceship, two characters, a pinkish monster and our gold-goggled hero. The wild symbol is a golden ‘W’ and there’s a scatter which is represented by a blue ‘S’ on a gold sphere. Cosmic Fortune features cascading reels which we’re always pleased to see; each time you land a winning combo in the base game, those symbols will disappear to make room for more which fall in from above. More winning combos will subsequently disappear and so on – it’s like lots of little free spins. This is triggered by landing three or more of the ‘W’ scatter symbols anywhere in view; you will now receive ten free spins and each time you create winning combo, that number of symbols will be converted into marbles and collected underneath the reels. Any more scatters landing during this feature will add five more spins to the total. Now the next stage starts and this takes the form of a pachinko-style game in which a spaceship flies back and forth at the top of screen, dropping your marbles into the setup below; this includes four cups which win prizes if hit and a jackpot collector cup. Coin wins are totalled and the round is over when the marbles run out. If you can land three marbles in the jackpot collector cup you will activate the progressive jackpot game. There are always fifty marbles to drop here and you are trying to land three in any of the five jackpot cups. These correspond to the jackpot totals above the reels – Mega, Major, Midi, Mini and Rapid. Three in a jackpot cup wins you that prize. This game also contains cups which will award a coin win. This is another great-looking and sounding game from Net Entertainment with a really creative bonus feature and a progressive jackpot which feels almost obtainable. An RTP of 96.90% is not too shabby either. Wonder boy vs aliens, that’s what they should named this game but Cosmic Fortune sounds okay too. It occurred to me, NetEnt’s created their new games by mixing a few concepts from the existed games together and give it a name. Cosmic Fortune has 15 fixed paylines, 5 jackpot prizes and falling reels instead of normal spinning reels. When you open the game, you’ll be presented with a arcade style intro movie, this is a very nice tactic from NetEnt because the majority of gamblers are over 30 years old which means that arcade is a part of their lives. I love it and I never skipped the intro movie because the score is so fun. When Cosmic Fortune was released, you’ll noticed that the minimum coin denom was set to 2 cent, that means the minimum bet is 30 cents. I strongly believe it’s because of the jackpot prizes. But a few months later they’ve changed it to 1 cent per line, this might increased the popularity of the game, I actually played the game more often because of it. In order to trigger the bonus round, 3 scatters are needed, the more scatters collected, the more free falls you’ll rewarded. The bonus feature is multistaged. In the free falls feature you need to collect the silver balls, the more often you win in the free falls, the more balls will be added to your account. With those silver balls you can win the jackpot. So far, I didn’t managed to win any jackpot prize. I have played this game at least 60 times with an average amount spins of 300 per session and more than 10 times near jackpot win. Cosmic Fortune is a fun game to play, even if you don’t win the jackpot. I always get excited when the balls start falling and sometimes I covered my eyes and waited for the sound of the third ball falls into a jackpot prize. Like I said before, it never happened. This game is a Cosmic Unfortune to me. Hopefully someday I will walk away with the biggest Cosmic Fortune jackpot in my pocket. 15 cent is all you need to play this game and a single spin could fattened your wallet enormously. I don’t play jackpot slots now a days but I tried out Cosmic Fortune even though I didn’t like it on the first sight. Very well designed, powered by NetEnt this video slot comes with nice graphics and very pleasant background soundtrack. This video slot theme is the universe and cosmic world. I found no mystery in here but there is a lots of prizes up to grab if you decide to play and stick with this game.I haven’t play in a while, how I wish I can play all my favorites whenever I want to. Leaving my wishes aside let’s see what you could possibly win if you decide to play this slot. This is a 5-reels, 15-pay lines video slot and even though I had just a several runs on it, I can tell I had so much fun and I managed to boost my balance with occasional wins the last time I plaid it. This is progressive video slot and jackpot prizes increases as you play. This game features 5 jackpots. Rapid and Mini jackpot will pay out fixed amounts. I think I was close to hit whether ‘rapid’ or ‘mini’ jackpot and that was the moment this video slot kind of caught my attention. I thought I will play it more often but since the last session I quit playing as I couldn’t stick with a game I wasn’t familiar with so I switched to those I already checked and those that already produced some BIG WINS which ended on my e-wallet after withdrawals. Now that I reviewed this game I will definitely give it a second try. Paytable looks kind of poor with highest valuable symbol paying 1500 x your stake for collecting 5 of a kind. I also like Avalanche feature like we have in Gonzo’s Quest. There is a ‘Free Falls’ bonus game which is triggered by getting 3 or more Scatters. You get 10 Free Falls- spins. Each additional scatter appearing in the base game will add additional 5 free spins to your win.Wild symbol only function is to substitute for all symbols except for the scatter and it appears only on reel 2 and 4.Free Falls Bonus Games starts once the Free Falls free spins ends up. These bonus features are where you stand chances to win in this game. All in all,it’s a nice game and I recommend it. 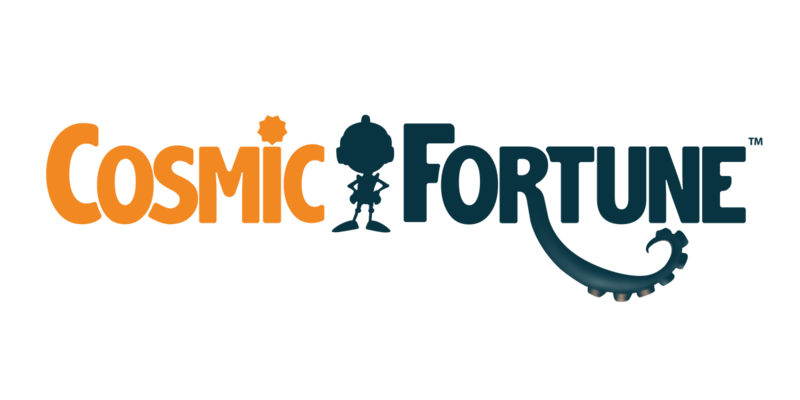 Cosmic Fortune was launched on 24th November 2014. I had so much going on in my life back then, like I always smiled, but I truly don’t remember a single thing what was discussed back then. I think I was too disappointed for not getting married! Hahaha, but I am super happy that I didn’t actually. I’ve been listening to Cosmic Fortune soundtrack for the past 30 minutes, my dears! Can you believe it? And I can’t stop either! Just as it was when I did the same with Amber’s soundtrack in Immortal Romance. The last time I played Cosmic Fortune with real money was about a year ago. Too long a break, because this is a truly amazing slot and I think it is a must-try slot for any gambler. Of course, Cosmic Fortune is special not only because I like it, but for several other facts. Let’s see what it is all about. This is NetEnt’s first ever slot to feature an amazing five jackpots and it is part of a series of ‘fortune’ themed games, the best known to all of us being Mega Fortune, which you can find, along with Cosmic Fortune, in the most reputable casinos nowadays. Mega Fortune has the world record for the biggest online jackpot payout, but I don’t like the game very much. I like Cosmic Fortune much better. When playing it, you get the feeling like you’ve entered into the cosmic and walking on the planets! Maybe Planet Mars, with cute little creatures around you, just like the symbols in this epic slot. Two of the jackpots will pay out a fixed amount of €100 and €500, for the Rapid and Mini Jackpots respectively. The other three jackpots are progressive ones. Unlike Mega Fortune, the three progressive jackpots in Cosmic Fortune are localised jackpots, which means that the pooled jackpot prize grow independently at each casino. This space-themed game comes with 5-reels, 3-rows and 15 paylines. The minimum bet is 0.02 cents. NetEnt used an avalanche feature, like that in the Elements, The Awakening game, and as in Gonzo’s Quest too, which is designed to create additional winning paylines and huge wins. Explosive and neon gold avalanche feature adds a special effect when covering your screen. The symbols that make up any winning payline disappears and new symbols tumble down to replace these symbols, creating even more winning combinations for the player. I thought only Thunderkick would be interested in putting out 8-bit graphics game, but I was wrong! So, when NetEnt came out with this Cosmic Fortune game in 8-bit graphics, I went like “oh, what the f**k!” I didn’t quite like those games from Thunderkick, but luckily, this Cosmic Fortune game turned out to be something different! From the introduction video, I thought I would be playing a 20 year old game! But unlike Thunderkick, NetEnt’s Cosmic Fortune used 8-bit 2D graphics only for their intro and intermediate animations, much to my dislike, no doubt, but the actual base game and the free falls game are nicely presented in the usual 3D manner. Phew! That was a relief! Otherwise, I don’t think I could have liked this game at all! The base game plays like any other rolling reels game, like Gonzo’s Quest. The winning symbols would explode, vanish, and new ones would drop down to replace them. 3 scatter symbols would award a 10 free falls game. Every symbol that explodes during the free falls game would be collected as marbles, the total number collected would then represent the number of marbles you get to play with in the Bonus game. Here, your main aim would be to get 3 marbles into the center collector Bonus cup, which would then award a jackpot game. Yes, Cosmic Fortune’s main attraction are the Jackpot Prizes that can be won, there are 5 of them, namely the Rapid, Mini, Midi, Major and the Mega Jackpots. All the other marbles that got collected in the other four collector cups win coins prizes. Confused? Well, don’t be. It’s all very simple actually, but you need to play the game to really appreciate it all. In the Jackpot game itself, you get 50 marbles to play with, and these marbles are then dropped one by one from the plane. Your target is to get those marbles into any of the 5 jackpot collector cups, each cup bearing a jackpot prize. Those marbles can also fall into the other 4 collector cups and win coins instead. Needless to say, I’ve had several near misses on the Mega and Major Jackpots, with 2 balls already in, needing just 1 more elusive ball to get in, but they never do! But, I did win the Mini Jackpot ($500) on one occasion and also the Rapid Jackpot ($100) on another occasion, and that was rather gratifying, I must say, hehehe. From there on, I became quite addicted to this Cosmic Fortune game, for a while at least, until the novelty slowly fizzled out in the long run, with no more jackpot wins for me, not even any wins from the base games either. And with that, Cosmic Fortune never saw another play from me till this day! Nevertheless, I must admit that it is a fun game to play, and with great jackpot prizes to be won, if you’re lucky enough. Consider it lucky for me, because I did win the two jackpot prizes. Not a big sum, but satisfying enough. Your space adventure can begin thanks NetEnt who this time made sure to bring some new energy to their list of slot machines. For those who might not know Cosmic Fortune brings huge progressive jackpot that currently stands at € 320,000 and is constantly increasing. I was not even close to winning such high awards and honestly and I expect something similar to happen although I am an optimist in life. It means a way of turning the drum is very similar to the Boom Brothers slot or Evolution, because just like in these games, and here you do not have square symbols that are turning properly from top to bottom, just in Cosmic Fortune symbols are round and floating in space, which is logical considering the theme of the game. On Cosmic Fortune I last week at Guts Casino won about 510 € for an hour, and it happened thanks to the Midi jackpot prize, which was my first experience with such high profits in just one spin. I love the animation and the creation of symbols, mysterious sound is in line with the theme of slot machines, all at your fingertips it is only necessary to open an account at one of the many NetEnt casinos and let the fun begin. When you return from your perfect NetEnt universe, it would be nice to share with us your experience, as I am. Cosmic Fortune is video slot with 15 paylines from NetEnt software company. This one offer jackpot game so I think is very popular when players chasing jackpots money. The graphics and sounds are great. I like main game because it has falling symbols and when you have wining combination other symbols came up to the reels. It is similar with Gozno’s Quest with this falling symbols. When I was playing it the game was not in the mood. I received at main game small winnings and later when I done few last spins I received free falls feature. This contains 10 free spins. The free falls bonus game starts at the end of free falls feature. This could give you a chance to get into game for some jackpots. I received this bonus later after free falls feature but I didn’t won any jackpots. I think I should play this game more often because it offer great potential of winnings. And by that I mean jackpots. If you are lucky all can happen. Otherwise I saw some nice pictures of wins at this game but most of them were hit of jackpots. I think that free falls feature could be much better. I didn’t received big win on it. There is also quick spin button but i don’t know why they added it into this game. First I played without it and later when I selected it, i didn’t saw many differences. The symbols in this game falling very quickly not like at Gonzo’s Quest game. Cosmic fortune it is game made by Netent, and I think it is their recent game which have jackpot. I play this game usually, probably in 50% of my gambling sessions I visit this slot game. It is awesome one! First thing that I like with cosmic fortune – it is impressive sounds and music. Music is very relaxing, I really enjoy it. Also I do like how this game made – very nice ideas by designers, all features and animations are stunning good, and it is really hard to express everything with words, it is just more better idea to check it yourself. Also I do really like idea with avalanches. Apart from regular idea there is no any multiplier for second win and so on. But it is still good, because I got a lot of good wins due to avalanche, and also I do get third scatter quite frequently with this feature. Jackpots here is great. Looks like two lowest ones is always same, or I am just mistaken, but most times I see two lowest jackpots is 100€ and 500€ . While biggest one is quite different in each casino, I think biggest jackpot is different for each casino, and not like Mega fortune jackpot for example. Most I have seen was about 130 k €, which is great. Bonus game in which it is possible to win jackpot is awesome, check it yourself. I had pretty good and pretty bad sessions on this slot game. Sometimes freespins features goes like crazy each 15-20 spins and it is not paying huge, but constant 40-60 bet wins is really boost balance. Cosmic fortune slot made by Netent, and it is their latest slot with jackpots. I tried this game couple of times, because there is strange thing. Slot has only 15 pay lines, but at most casinos min bet is 0.30. Even more, at some casinos it is huge 0.75$. And based on fact that you can win something decent only during free spins, it is hard for low players like me to play this game. But still, I do like this slot. It looks great, and also there is using avalanche system for spins, like at Gonzo’s quest, or at elements (this is other Netent slots). Here unfortunately no extra multiplier, for couple wins in a row, but couple of times I hit free spins due to avalanche, so yeah, I like it. Free spins is great, each winning symbol give you one ball to bonus game. If you manage to hit jackpot bonus game 3 times during bonus round – you have a chance to win one of the jackpots. Jackpots not so big like at mega fortune or hall of gods, but hey, even couple of thousands it is already very nice money (at least for low guy like me). Once I almost won it, had 2 balls already in three jackpots pots, but third ball does not want to come. Funny, last ball was going to hit it, but… Well, next time win,like my username. Overall my experience is good. Also I do like this slot, because looks like chances to win jackpot in this game is much more higher than on other jackpot games, and for me this is good reason to play this slot. Recommend to try if you still no to do so. I’ve always been a big fan of cosmic things, so my review will be for a great Cosmic themed slot game from Netent software – Cosmic Fortune. This game is very interesting because it isn’t like other Netent or other software games. It is a 5 reel 15 payline slot, the design is very cool and the 2 things that make it special in my eyes is the fact that instead of spinning, the symbols fall. Similar to other games, if you get 3 scatters on reels, you’ll get 10 free falls. The other thing is that it has 5 jackpots! Where else have you seen something like that? So about the features. If you get at least 1-3 scatters, you’ll get 5 free falls. This feature is very easy to get and once I counted that within 100 spins, they appeared around 12 times. They haven’t given me big winnings, but still it increases your winnings for a bit. Second feature are when you get 3 scatters, you’ll be awarded with 10 free falls. The winnings from them are collected in marbles, but the most fascinating thing only begins – after the 10 free falls, you’ll move to Free falls bonus game. There balls will be dropped out of a helicopter and where they’ll land the most, that will be your prize – whether it will be coin wins or jackpot collector. At first, when I first tried this game some time ago, it had just landed and I was interested in it. I played it for not long time, didn’t get any wins or bonus game and was a bit disappointed in it. And that’s how I played it – every now and then for around 50 spins, no nice wins and quit. But this month I’ve been playing it more and gave it a shot for 500 spins. I played with 0.30€ bets and had few bonus rounds, got to play the jackpot collector game but ended with 10x bet wins. But I will continue to play it, especially now when one of our fellow members had got a mini jackpot from this game, that definitely inspires to not give up. So far I think that this game is definitely worth trying, the design is really great and the jackpot collect game is very exciting. I haven’t got good wins from it, but I think they will come. Cosmic Fortune is another NetEnt release which I’m certainly not pleased with. I think most online gamblers are familiar with NetEnt’s creativity and innovation when it comes to designing new and attractive video slots. With Cosmic Fortune it has not only created another slot with a cosmic theme, but also one which outperforms other progressive slot games in terms of quantity. The game features 2 fixed jackpots and 3 progressive jackpots. No other progressive slot I know of has this. Mega Fortune, Hall of Gods and Mega Moolah… None of them have as many jackpots. The jackpots on Cosmic Fortune are much smaller though. I don’t like these type of games though and Cosmic Fortune not at all. Cosmic Fortune offers 15 paylines in a free fall type of slot just like Gonzo’s Quest but with no multipliers. In addition, it also has a free spins feature and a bonus game where one of the jackpot can be won or an award in bonus coins. The minimum bet at the casinos where I played this game was 30 cents. My experiences with the base game were terrible. It’s almost impossible to get a good hit in the base game and the odds on winning one of the jackpots seem quite terrible as well. It also has wild symbols and scatter symbols which can award the free falls. I won 10 free falls a couple of time but never ended up winning more than 10x bet size. After free fall you get taken to some kind of pinball game with the possibility to hit one of the jackpots. I once made it to the second phase and of course no jackpot won, just bonus coins. I don’t like the new slots from NetEnt since they take your money slowly and never make it possible for you to be on a point of profit it seems. I must admit the concept is nice, but to compensate those jackpots I guess the base game must fall short I suppose. I’ll avoid this game in any case. The play of the game is like being “easy”. For a bet of 15 coins you have one fall of the symbols. The 3-10 coins win are not large, but as I said played a good casino, one can play more than 200-500 spins for 5 Euro. Then, what is very nice here is the round of 10 Free Spins, which is followed automatic by the bonus game and in certain circumstances by a second bonus game where you can win one of five jackpots. And one has enough chances to win a jackpot, because very often one will enter the Free Spins. All the winning symbols from the 10 Free Spins are transformed into pinball balls and are dispersed in the bonus games by the man into the helicopter (this is a sort of galactic pinball). In my game after 350 spins played I had more than 11 Euro extra gathered. The game relaxes you completely. A feeling of relief and calm takes on you and it is like you could be spending some other time here, especially because you do not lose too much. Cosmic Fortune slot is provided by NetEnt entertainment. It is one of their newer slots that they have released, so I thought to give it a shoot. This slot is a 5 reel and 15 payline slot with 3 rows. The minimum bet that can be placed in this slot is 0.30$ per spin. As far as the graphics for this slot by my opinion it isn’t really special, but I love the background sound of this game it is really relaxing to play with. Also I have to say that these symbols, throughout the whole play time I couldn’t adapt to them. This is also a game that has the avalanche feature something like in Gonzo’s quest but without the multipliers. So basically with every winning line no matter how big or how small it may be it will drop down and new symbols will replace them, giving you a chance to accumulate more winnings and therefore greater payout. This feature will end as soon as they are no winning line to the reels. Then we have the free fall feature that awards 10 FS for 3 scatter symbols that appear on the reels, also every additional scatter symbol that appears will award 5 extra FS. In my opinion in the most times you will hit this feature thanks to that previous feature that I explained. At least that was the case with me. Also the free falls feature starts when the avalanche feature end and in the free falls feature all the winning on the bet line are transformed into marbles that will later on after the free fall feature ends be used in the bonus game. There are 2 bonus games; I only managed to play the first one since I wasn’t lucky enough to trigger the second one. In the first bonus feature basically on the sides you have cups that will capture the marbles that fall out of the plane above and will award you with coins and in the middle you have the jackpot collector cup. 3 marbles will activate the second bonus game, which as I mentioned I have not manage to hit I did most of the times collect 2. It seems to me that 16 bit HD graphics video slot is a new hit nowadays. First was Arcader and then Cosmic Fortune but only the intro movie thou. Speaking of which, I love the intro movie of Cosmic Fortune. It’s kinda funny. Those space ships reminds me of the good old Atari game Defender, no color, big pixels. The main game looks also awesome, it’s pity it has 15 paylines but no worries because the jackpot bonus round could give you big win! Honestly till today I still haven’t won any of the jackpots. Maybe you need to wager a larger bet than the minimum. If you are a NetEnt fan then you know that Cosmic Fortune has the same bonus round as the game from the same provider The Invisible Man. Cosmic Fortune has a multistage bonus round. The free spins bonus round winnings decide how many white balls you get, the more balls the more chance of getting to the second bonus round which has a fixed amount of balls (50). Till now I got 6 bonus rounds which half of it were a non next stage bonus rounds. By the way, the minimum denomination of the coin is 2 cent, to me it’s quite expensive because most of the time I bet with the lowest coin denomination of 1 cent but my curiosity of winning the jackpot made me do not care about it at all. The biggest win I won on this game was 850 credits (17 euro) and that’s all actually. I’m just eager to win any jackpot from this game and that’s why I will keep playing this game till I won 1 of their jackpot. I do recommend Cosmic Fortune to all my fellow gamblers and I hope someone from this forum will win the jackpot and post the screenshot here so we all can see that the jackpot is real and can be won with no problem at all. If I win the jackpot I will surely post the screenshot here! no doubt about it. 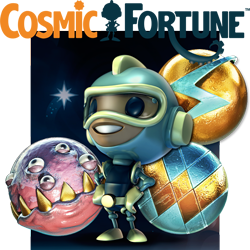 Cosmic Fortune gets 7 stars rating from me because of the great graphics, sounds and gameplay. If I had won the jackpot this game might get 2 extra stars but unfortunately this was not the case. My next review will be on Cosmic Fortune video slot, which is the newest game from Netent provider. Lately I must admit I am disappointed from Netent, well except from the Wish Master video slot, I think that game rocks because I had really nice winnings on it, but the other game which were promoted this year I can’t say the same thing, but this one Cosmic Fortune slot, I think I will pay more attention to it, by my opinion, I think this game will become one of my favorites. This is a 5 reel with 15 paylines video slot which the minimum bet is 0.15 euros per spin and the Theme about this new Netent slot, is all about Aliens and Planets, so that’s why I guess the name of the slot is Cosmic Fortune. Few days ago all the Netent casinos, were having promotion of the Cosmic fortune slot, so yes u tried this game. This game reminds me a lot of the Gonzo Quest game, with the avalanche feature, how they lend they will blow and make place to another features to lend on the reels and that way you will be getting some other winning combination. Cosmic Fortune slot has 3 Jackpots, hoping that I will trigger one of them, haha, well you never know, right!! I also like this game, because there is a bonus round and a free spins feature and a wild one, which appears only at 2, 3, and 4 and substitutes all the other symbols except for the scatter ones. When triggering the free spins feature, 3 scatters lending anywhere on the reels will award you with 10 free spins and if you managed to trigger more than 3, like 4 then every next scatter will award you with another 5 free spins. When I played this game I only got the free spins once and honestly didn’t get me some extra winnings, but since it’s a new game I will surely play it more, to find out will this game bring me some wild winnings.